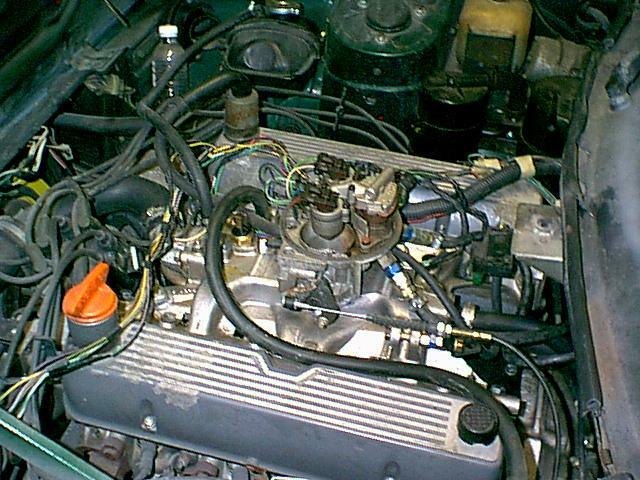 Intake Manifold: The first decision to make is what intake manifold to use. We can supply an Edelbrock manifold correctly modified to accept stock TR8 heater hoses, thermostat housing, fan sensor and coolant sensor for the fuel injection. When using the Edelbrock manifold it will be necessary to either make or purchase an adapter to permit the TBI unit (which has a three bolt 'triangular' pattern) to be attached to the standard four barrel pattern that the Edelbrock has. TurboCity.com makes a steel adaptor p/n 635-600. The other manifold alternative is our modified factory manifold as shown above. 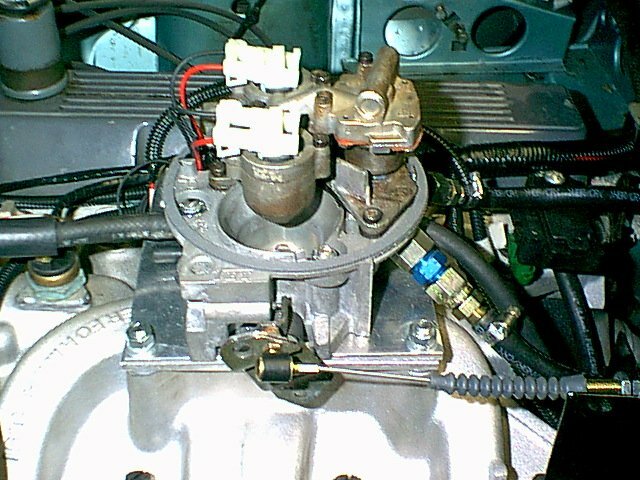 For owners who do not care about keeping their original Stromberg carburettor setup for posterity, this is a less expensive solution, but requires that your old manifold is returned and is usuable as a core. Another advantage of the modified factory manifold, is that bonnet clearance is improved. The TBI air horn flange is approximately 73mm from the base of the manifold (fan) temperature sensor, whilst the modified factory manifold reduces this to approx. 55mm. Throttle Body Unit: Our choice for the TBI unit is one from a 4.3 litre V6 engine. These can often be found in salvage yards on late 80's Astro vans and the like. 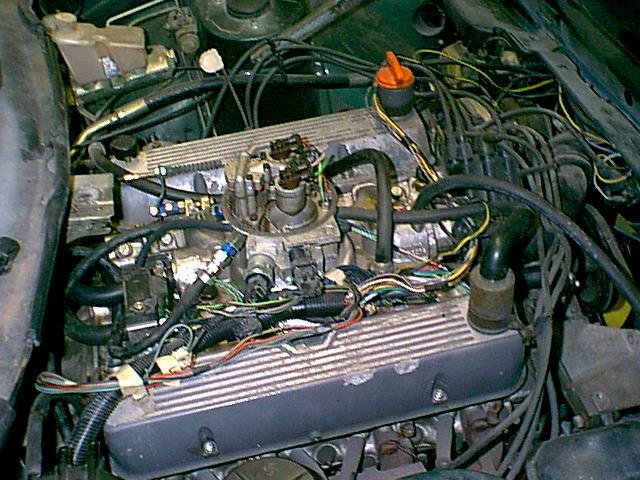 The 4.3L TBI should have 46 lb/hr injectors fitted thus making it quite a good match for the Rover 3.5/3.9 engines. 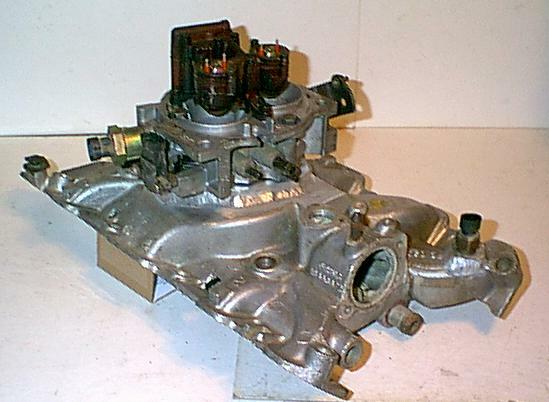 TBI units are rebuildable but don't pay too much for one unless you can be sure the injectors work! Injectors are rather pricey at approx. $65 each. If you end up needing new injectors, GP Sorenson p/n 800-1817N are the ones to buy. The part number for the TBI rebuild kit is: 96-3012. There should be a grommet on the TBI where the injector wires pass through. Unfortunately, these are usually missing or badly deteriorated and GM does not make that part available separately! Two other TBI part of interest: 10129563 is the TBI gasket to manifold and 25511809 is the air cleaner gasket. To connect the fuel feed and return lines to the TBI you will need the fittings shown below. Essentially the task here is to adapt the 7mm clamped hose fittings on our cars fuel lines to the different sized threaded fittings on the TBI unit. The feed hose is 65cm long and the return hose needs to be 50cm. The 'blue' fittings are made by Earl's. These are male-male fittings which screw into the TBI. They can be difficult to find, so we keep a supply on hand if you cannot find them locally. The 5-6FJX fittings are the same and these screw on to the blue Earl's fittings. 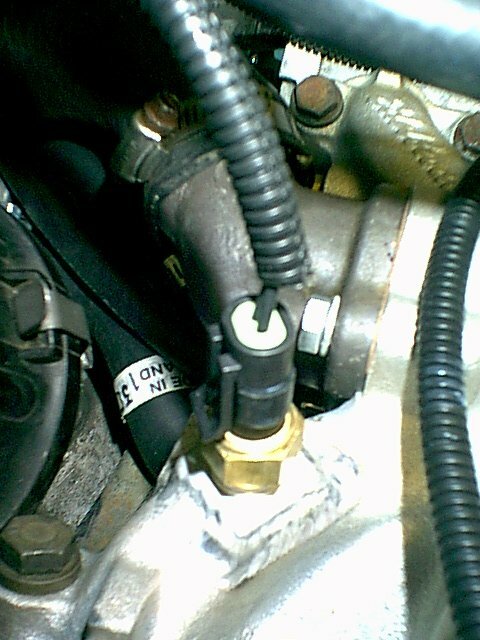 The 5-6FJX fittings have a spigot for the rubber hose to clamp onto. The TBI is secured to the manifold using three 5/16 UNC x 2 bolts. Sensors: Coolant Temperature - A modification to the intake manifold will be required to accomodate the coolant temperature sensor. Both our Edelbrock and factory manifolds are supplied with the coolant sensor tapping. To avoid leaks you will need to use some thread sealant. The coolant sensor is GP Sorenson p/n TSU81 or equivalent. Throttle Position Sensor (TPS) - Chances are that the used throttle body unit one gets will come with the wrong TPS. The problem is that the connector on the sensor is vertical, and thus is higher than the TBI flange which creates bonnet (hood) clearance problems on our cars. To solve this you will need to buy a new TPS (GP Sorenson p/n TPS108) with a horizontal connector. Manifold Absolute Pressure (MAP) - This sensor measures engine load in kPa from 0 to 100. It is the opposite of engine vacuum. 100 kPa is zero vacuum or 100% load. The MAP sensor needs to be mounted so that the vacuum port faces downwards, and needs to be near the TBI unit. Usually there is an unused tapped hole in the right rear of the Rover & Edelbrock intake manifolds. You will likely need to fabricate a simple bracket to raise the sensor somewhat to allow room for the electrical connector which plugs in from underneath. The MAP sensor is p/n GP Sorenson SU105. Idle Air Control Valve (IAC) - These can get gummed up with carbon deposits, so it is quite likely you will need to at least clean one on a used TBI unit. The new one I used was p/n 779-10003 and they are supposed to be self adjusting, but I still have idle quality issues on the green TR7 V8, so take that part number with a grain of salt! Oxygen (Lambda) O2 - The O2 sensor can be mounted in either downpipe above the catalytic converter. You will need to have a threaded 'bung' welded in. These can be obtained from Jegs p/n 555-30740. The Jegs part is nicely made and has a thick wall which should minimise chances of distortion during welding. A cheaper alternative is just to use a large nut! The O2 sensor itself is Bosch p/n 12014. With the exception of the TPS for the reasons described above, these sensors are usually quite durable so if you are working to a close buget then by all means grab used ones from the salvage yard whilst getting your main components. A bad sensor will usually set a trouble code. 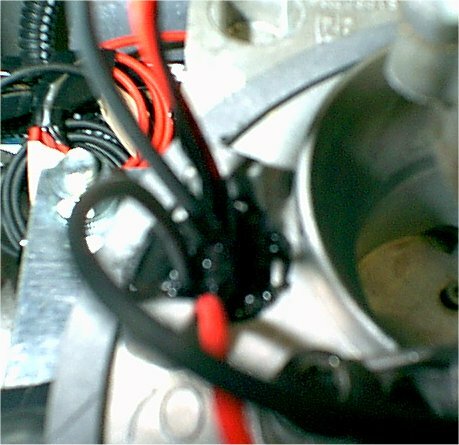 Emission Controls: Air Injection - We have deleted the air injection system. The feedback from the O2 sensor should keep the air/fuel ratio very close to 14.7:1 making air injection unnecessary. Furthermore 1981 models with factory injection did not use air injection. Exhaust Gas Recirculation (EGR) - Although extensive parameters exist in the EPROM calibration file for EGR control, we have not yet found a way to mount an electronic EGR valve to the Edelbrock or factory intake manifolds. Positive Crankcase Ventilation (PCV) - The hose from the breather is attached to the large port in the centre front of the TBI unit. We had to use a series of 'stepper' hoses because of the reduction in diameter. The hose at the rear of the left hand valve cover is replaced by part numbers: ERC3208, ERC3209 & ERC3933.